Countries must massively ramp up their action to cut emissions to prevent global temperatures rising beyond dangerous thresholds, a United Nations report warns. It says cuts to greenhouse gases must triple compared to current plans over the next 12 years in order to keep temperature rises to 2C above pre-industrial levels, the limit agreed by nations under the international Paris climate deal. To meet the more stringent aim in the deal of curbing temperature rises to 1.5C to avoid more extreme climate damage, levels of ambition on cutting emissions must increase five-fold, the UN Environment study said. The annual report examines the emissions "gap" - the difference between where the world is likely to be in terms of cutting pollution in 2030 and where it needs to be to prevent temperatures climbing to dangerous levels. It finds global greenhouse gases rose in 2017 to new highs of 53.5 billion tonnes, after three years of carbon pollution from energy and industry being relatively flat, which prompted hopes emissions were peaking. 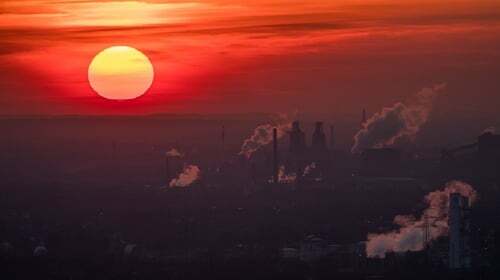 Global emissions must peak by 2020 and decline significantly by 2030 to meet global goals to limit temperature rises to 1.5C or 2C above pre-industrial levels, to avoid the worst impacts of climate change, the report said. But national pledges by countries to cut their emissions, made as part of the Paris Agreement, are putting the world on track for warming of 3.2C by 2100, and more temperature rises after that year. On current trends, emissions will not even have peaked by 2030, the study warned. Increased emissions and lagging action means the gap between what is likely to happen and what needs to be done to avoid dangerous climate change is larger this year than ever. It is still possible to keep global warming to 2C, but the "technical feasibility" of meeting the tougher 1.5C goal is dwindling, UN Environment said. And if the emissions gap is not closed for 2C by 2030, even the less stringent target for curbing global warming is likely to slip out of reach, it said. The UN Environment annual emissions gap report comes after a major study from the Intergovernmental Panel on Climate Change (IPCC) warned of the need for "unprecedented" action to slash carbon emissions by nearly half (45%) by 2030 to curb temperature rises to 1.5C and to zero by 2050. The IPCC review found that limiting temperature rises to 1.5C would make the impacts of climate change, from droughts to rising seas and destruction of coral reefs, less extreme than global warming of 2C or more. UN Environment deputy executive director Joyce Msuya said: "If the IPCC report represented a global fire alarm, this report is the arson investigation. "The science is clear; for all the ambitious climate action we've seen - governments need to move faster and with greater urgency. "We're feeding this fire while the means to extinguish it are within reach." Leading economies can strengthen action by steps such as reducing fossil fuel subsidies and supporting renewable heating, while there is also potential to close the gap with wind and solar power, energy efficient appliances and cars and planting forests and preventing them being cut down. The report also highlights the potential of businesses, regions and cities to deliver needed emissions cuts, financial reforms such as putting a price on carbon and speeding up technological innovation. Richard Black, director of the Energy and Climate Intelligence Unit (ECIU), said while the growth of emissions in 2017 was a major challenge to governments, the report also showed "decoupling" of emissions from economic growth was continuing, with pollution growing by much less than the global economy. "So while some may see this as yet more doom and gloom, it's clear that governments can make global carbon emissions peak and decline soon if they simply do more of what's proven to work, such as cutting energy waste and switching from coal to clean energy," he said. Meanwhile, a leading climate scientist at UCD has said that the changes needed to limit the impact of climate change are equivalent to the industrial revolution. Speaking on RTÉ’s Drivetime, Dr Cara Augustenborg said the climate gap refers to the difference between emission levels countries have pledged to commit to, and the level of emissions we need to stay under to keep below 2C of planetary warming. She said that in Ireland we managed to reduce our greenhouse gas emissions during the recession, but now that the recession is over we are seeing them spiralling out of control, particularly in things like transport. She said we need to close the gap by 2030, but instead it is increasing. "We should be decreasing our emissions by about 5% a year, instead we are increasing them by 3% a year," she said. "We need to make changes now. We need to see decreases starting this year and continuing to 2030 if we have any hope of closing the gap."